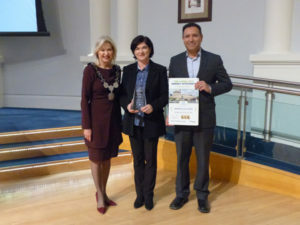 The City of Mississauga receives multiple energy awards for its energy conservation and innovative efforts. The city received the following energy awards. Energy in Action Innovation Award: Best Municipality/University/School/Hospital Customer (1 MW+) within the Greater Toronto and Hamilton for excellence in energy conservation through energy-efficient technology, operational best practices, and staff engagement. The Living City Energy Efficiency Gold Award for City Hall recognizes leadership in sustaining a high level of energy and environmental performance at City Hall. Energy Manager Award recognizes the effort and dedication the city has shown to create a more sustainable and energy-efficient workplace. Raj added in 2017, the energy management team launched a ‘Race to Reduce’ campaign among staff at 19 city facilities. The goal was to find no- or low-cost energy-savings measures. The facilities have saved approximately 3.96 gigawatt hours of electricity and $343,000 in annual costs since then.